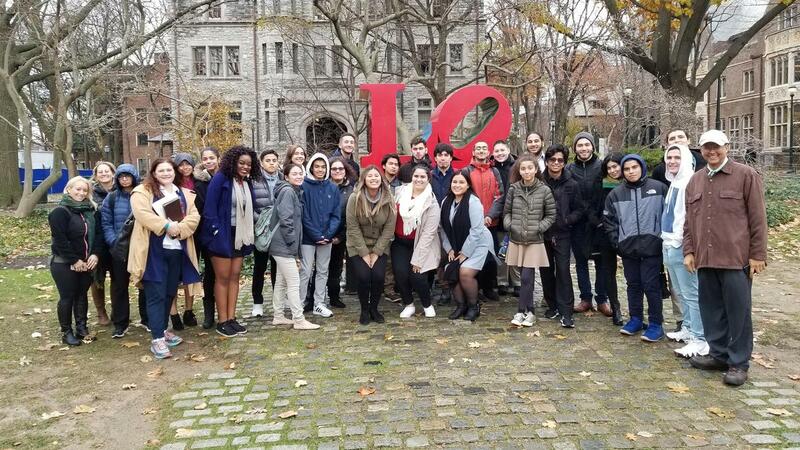 STEM Academy students, along with Student Council members and our AP Calculus class, enjoyed a day at The University of Pennsylvania in Philadelphia. 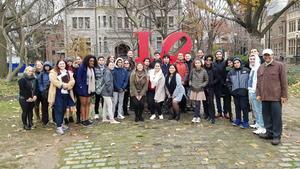 STEM Academy students, along with Student Council members and our AP Calculus class, enjoyed a day at The University of Pennsylvania in Philadelphia. Teacher chaperones who accompanied the trip were Sivanandan Ganesh, Yaniris Maldonado, Michelle Martoral and Stephanie Stern-Protz. The students took part in an admissions presentation, and toured the campus with a dedicated UPenn tour volunteer. Here is a photograph of them in front of the world-famous "LOVE" sculpture by Robert Indiana. In addition, the students got to have a real college experience when they stopped by the Spruce Street food trucks for lunch! Thanks to the University of Pennsylvania for their hospitality and hosting our students for their fall IVY visit. "STEM Academy is dedicated to the success of our Cohort Classes and those students who wish to pursue STEM college and career choices." - Dr. Jared Keshishian, Chair of the STEM Academy and District Supervisor of Science.